.... the husband will cook! I shouldn't say that, Jon loves to cook and he's very good at it. He already has several of his own entries in this blog for things like filet mignon with a red wine reduction, a variety of shrimp dishes, his incredible chili, and a bunch of marinades for grilling. 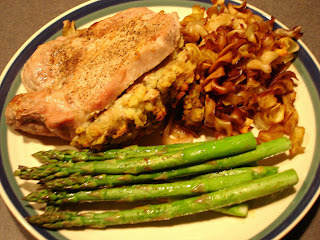 When I was away this week he decided to make one of his favorite childhood meals - stuffed pork chops. And somehow he ended up being my 100th post in my blog! 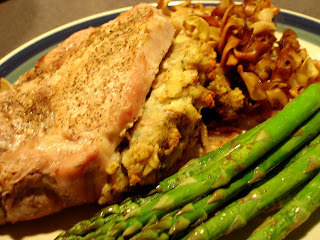 Slice a pocket into the pork chop; fill generously with the stuffing. Bake covered for 30 minutes; uncover the dish, turn the pork chop over, and bake for another 15 minutes uncovered. Cooking time may vary depending on the thickness of your pork chop. Jon's note: if you have any extra stuffing, it's good to layer on top of the noodles or to munch on while drinking wine and waiting for dinner to be done. Jon's second note: when his mom used to cook this dish she'd bake the pork chop on its own for 20 min, then layer the noodles in the bottom of the dish and continue cooking. His noodles got a bit crunchy cooking for so long but they were still good. He also made roasted asparagus, something we eat every week. He tossed the asparagus with olive oil, cayenne pepper, and a nice amount of chili powder, and roasted in the oven about 8-10 minutes. Mmm, I tasted the leftovers when I got home the next day and they were great! !